Gothic exterior of the Casa Loma is a medieval style castle completed in 1914 in the city of Toronto, Ontario, Canada. The beautiful Casa Loma, this Gothic Revival architecture has a medieval style with its pointed arches, multicolored stone and battlements. The walkway and driveway is filled with square stones that lead to the entrance. A Canadian flag decorates the top of the entrance way. 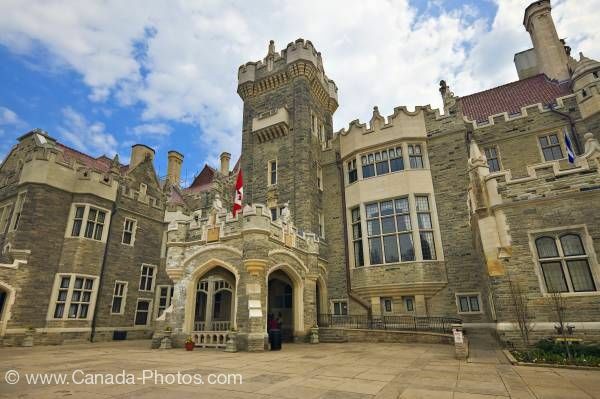 Exterior of the Casa Loma, a medieval style castle completed in 1914 in the city of Toronto, Ontario, Canada.